Beijing will make it easier for foreign talent to obtain housing and gain permanent residency, as a means of luring more top brains. The city will widen channels to bring in global talent and fuel the city's efforts to establish a science and technology innovation center, according to a report delivered on Monday by Mayor Chen Jining to the second session of the 15th Beijing Municipal People's Congress. Chen said that the municipal government will work with multinationals to set up research and development centers, while encouraging universities and colleges to launch innovation centers and support young entrepreneurs. Last year, the capital formulated 20 new policies to better serve skilled workers and create a favorable environment, including creating a rule that foreign talent can lead scientific research at the national level, and simplifying their entry and exit procedures. A science and technology innovation fund of 30 billion yuan was set up in 2017 for new technology incubation, he added. To make them feel at home, seven international hospitals in Beijing launched pilot projects to improve medical care services, and three local public primary and middle schools have increased foreign students' enrolment. Tan Xuxiang, director of the city's Reform and Development Commission, said the capital will attract and train a group of scientific talent regarding key technological breakthroughs and industrial development. Young entrepreneurs under the age of 30 will also be trained to become professionals capable of establishing international platforms. 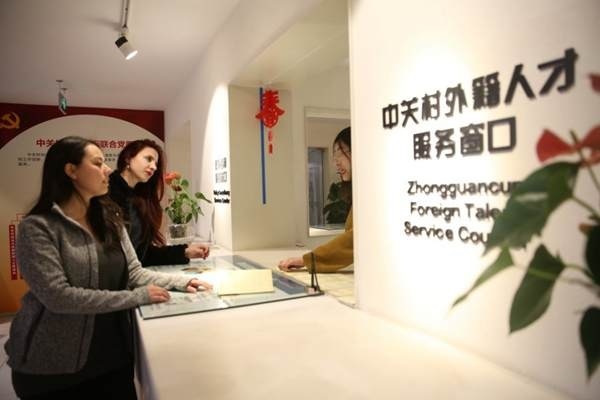 According to the Center for China and Globalization, a think tank based in Beijing, only 1% of the talent in Beijing's Zhongguancun area is from overseas.